There is much variation in the height and spread of the different Japanese Maple cultivars. Leaf size varies greatly but in all varieties produces vibrant spring and autumn colouring. The 'basic' Acer palmatum is sometimes referred to as the 'Mountain Maple' and is probably the strongest and most vigorous Japanese Maple. It would be difficult to describe every Acer palmatum variety in detail; instead those most commonly used for bonsai are described below. These include Seigen, Chishio, Deshojo and Purpureum. All have red leaves in Summer. Seigen and Chishio have feathery leaves and bright orange red Spring colour. Both of these cultivars have a naturally more dwarfed habit. Purpureum and Deshojo have broader leaves and are blue/purple toned in comparison. All red leaved cultivars are more susceptible to leaf damage in the Spring (before the leaves harden) from strong sun, winds or frost. However, all will start to lose their red pigmentation if kept in deep shade for more than a few days. Red leaved varieties are naturally weaker and slower growing than green leaved cultivars as they lack the same quantities of chlorophyll in their leaves. These varieties have an aged, rough textured bark, even at a relatively young age (5-10 years). Though there are a small number of Acer palmatum with this characteristic, the most vigorous and well suited to bonsai cultivation is the 'Arakawa'. This has light green leaves that turn yellow in Autumn. There are a number of varieties of A. palmatum that have a naturally dwarf habit and are very suitable for bonsai cultivation. Most commonly seen are 'Kiyohime', 'Kashima' and 'Yatsubusa'. All have naturally small leaves, shoots, branching and trunks. With the majority of Acer palmatum varieties it is necessary to build foliage density but these dwarf cultivars have naturally dense foliage and often need their leaves thinning to allow light inside the canopy. Dwarf cultivars (particularly Kiyohime) tend to be basally dominant; unlike the majority of plant species, the apex is weak and less dominant than the basal/lower growth and branching. Strong lower growth needs to be kept in check to ensure that the apex does not weaken too much. Varieties with dissected leaves tend to be slow growing and naturally weaker than other Japanese Maples. Many have a weeping or cascading growth habit. 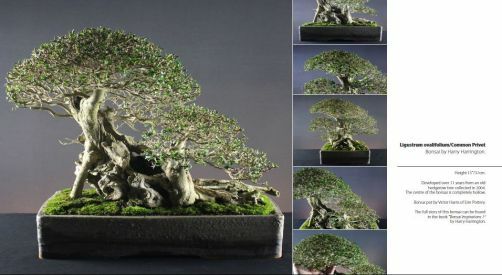 Obtaining suitable stock that has not been grafted is very difficult making Dissectum bonsai are rarity. Whichever Japanese Maple is chosen, the appearance across the range of the species is always striking, whether it's during the Spring, the Summer, Autumn or Winter, and a Japanese Maple bonsai out in the garden, on the patio or decking area is always pleasing. Prune back to 1 or 2 pairs of leaves after new growth has reached 3,4,5 pairs (depending on position on the tree). Large individual leaves can be removed leaving the petiole/leaf stalk as and when necessary. Gradually these leaves will be replaced be smaller and finer foliage leading to a denser canopy. To thin the canopy and allow light to penetrate the canopy to the inner branches; remove growth close the trunk, leaves that fall beneath the level of a branch and any over-sized leaves. Defoliation can be practised at midsummer on healthy trees only. Weaker red leaved varieties should not be defoliated. Green leaved varieties respond well but it is recommended that they not be defoliated 2 years in a row or in the same year as rootpruning. The aim of defoliating Japanese maples is to increase budding (and therefore leaf and twig density), produce shoots with shorter internode length and lastly, decrease leaf size. Defoliating weak trees may not necessarily kill them but will not produce the desired effects and in some cases will promote the opposite effect; a small number of large leaves on branches with long internodes. Acer palmatum bleed heavily if pruned in early Spring. This can be stemmed to a degree if the tree is rootpruned beforehand. I find it preferable to carry out general maintenance pruning and thinning of the branch structure in Autumn after leaf fall. For the removal of large branches or trunk chops that will cause large wounds, mid to late summer is the best time for these jobs as healing and callus formation is rapid. Avoid making large wounds before midsummer as callus formation can be very poor and result in dieback of the area around the wound. The main objective of pinching back acer palmatum growth is to keep internodes short. Acer palmatum branches with long internodes have poor ramification and denseness of foliage. Creating branches (and trunks on young maples) with short internodes means that creating a tree with dense foliage much easier. To achieve this objective, the first shoots in Spring should be pinched out. The most vigorous shoots are the first to open in Spring and so pinching out these will remove all shoots that have the potential to produce long internodes. With tweezers, open the newly opening leaves just as they begin to openand pinch out the central shoot. If you wait until the central shoot can be removed with the fingers, the internodes will have already extended to much. A second weaker budding will follow in 2 to 3 weeks time with shoots that have shorter internodes. The most vigorous shoots open first, by pinching the first crop of new buds to open, you help balance the trees' vigour throughout the whole tree. Energy and vigour is diverted to the slower, weaker buds on the insides and lower parts of the tree. The growth of dwarf varieties such as Yatsubusa and Kiyohime is usually quite balanced. However, due to their basal dominance, the strongest shoots are pinched back a little later than on ordinary Palmatums and this encourages back budding on the interior of the branching. With all deciduous species it is useful to retain shoots with short internodes (the distance between the leaf-pairs) and remove those branches with long internodes. Long internodes can be especially prevalent with Acer palmatum and in order to produce good foliage density, must always be addressed. Vigorous, immature growth on all Acer species will very often have long internodes. This is problematic because the distance between any future branching that occurs at the nodes will be great. Areas with long internodes will be difficult to create a dense canopy and often results in blank or bare areas of the trunk or canopy.